YANGON/DHAKA (Reuters): Scores of ethnic minority villagers have crossed from western Myanmar into Bangladesh in recent days amid fighting between the Myanmar military and ethnic Rakhine rebels, Bangladesh border guards and an activist said on Thursday. Members of 38 families said they fled their homes fearing attack from military helicopters, said Colonel Zahirul Haque Khan, the Border Guards Bangladesh (BGB) commander in Bandarban district where the group of 136 people are now living in shelters. Clashes between Myanmar’s military and the insurgent Arakan Army, which mainly recruits from the Rakhine ethnic group, have displaced more than 5,000 people in parts of Rakhine and Chin states since early December.Myanmar’s leaders have vowed to crush the rebels, who are fighting for autonomy for Rakhine State, and blocked most aid agencies from reaching the area, raising fears of more civilian suffering in an area long scarred by complex ethnic divisions. While Rakhine State is majority Buddhist, in 2017 attacks on security posts by insurgents from the Muslim Rohingya minority provoked a military crackdown that forced 730,000 people from their homes and into camps in Bangladesh’s Cox’s Bazar district, according to UN agencies. Win Thein, a member of the nongovernmental Bangladesh Human Rights Commission, said he had visited the refugees, who are members of the Khumi, Cho and Rakhine ethnic groups, in their remote jungle camp.They had crossed into Bangladesh on Sunday and Monday after fleeing from two villages in Chin state’s rugged Paletwa township after they heard gunfire and saw helicopters nearby, he said.Some villagers said they later witnessed Myanmar soldiers looting and setting fire to homes, he said. Win Thein said some of the refugee children were seriously ill and had no access to medical care. “There are no blankets at all and it is very cold,” he said. 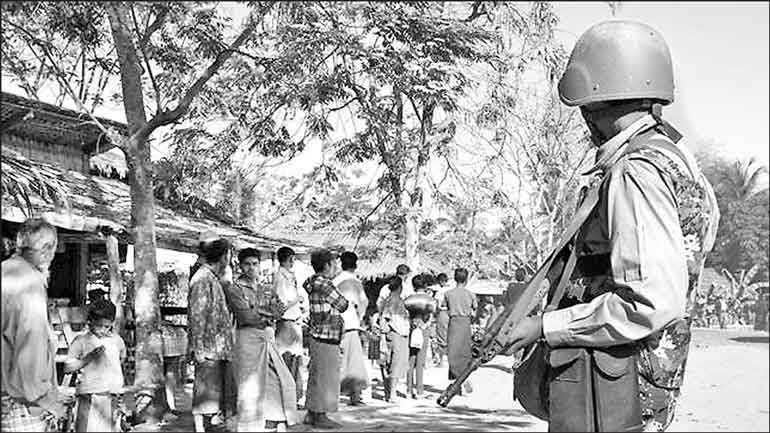 State media in Myanmar said on Friday the Arakan Army had “taken about 200 Rakhine and other ethnic nationals including 38 schoolchildren to Bangladesh territory”.